Visit Manhattan without a high price tag. 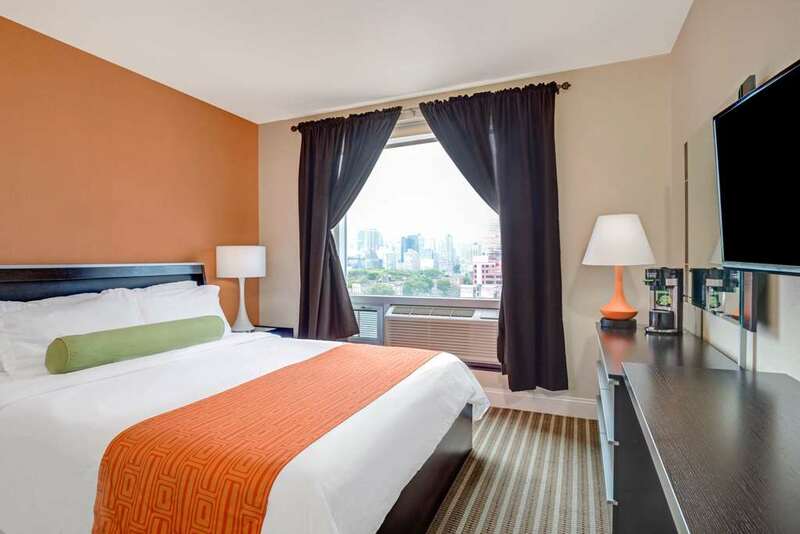 Our Howard Johnson Long Island City hotel is convenient to the New York City Subway system and just one stop from Manhattan. Nearby business headquarters for JetBlue Airways Corp. and JPMorgan Chase and Co. offer business travelers the opportunity to work nearby, but play in NYC. Enjoy our free continental breakfast, free Wi-Fi Internet access, on-site limited parking for a fee, and fitness center, all just five miles from LaGuardia Airport, and less than 15 miles from John F. Kennedy International Airport. Each of our guest rooms feature a flat screen HDTV, and select guest rooms offer Manhattan skyline views. Fax and copy service is available at our friendly front desk. Find diner fare at Aunt Rosies Restaurant, just around the corner from our Queens borough hotel. Sink your teeth into some serious BBQ at John Brown Smokehouse, just blocks away and open seven days per week.